Friday Visualization #6: Whoa! It is Big! Mr. Kelly: Africa is big, much bigger than the United States. Me: Much bigger? I doubt that. 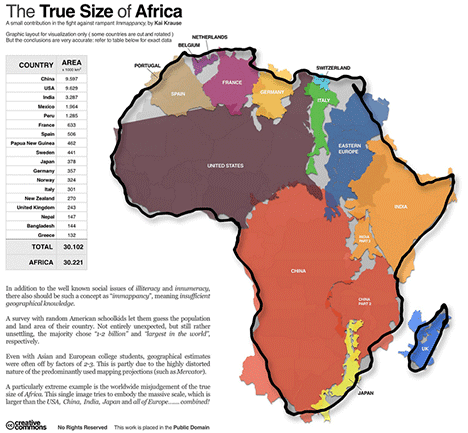 Mr. Kelly: No, it's because the maps we use distort the actual size, so you think Africa is smaller than it really is. Africa is big. Who knew? Apparently the guys over at Treehugger knew. You can read more about the visual here. Also, make sure to click on the HUGE version of this image and make sure you look on the right side of that image (you will have to scroll) for more info and visuals. If you were using this visual with your students, what kinds of questions could you ask? What sorts of observations can they make? What sorts of questions can they generate? What math is required to create a visual like this? What about the research skills required to complete this activity? Could students create their own maps using other countries? They could certainly use Area to find a collection of different countries that total the size of Africa (or Asia, or the USA, for that matter). What about doing conversions from metric to non-metric standards? There is a lot of geography that could be integrated into an activity like this. The point here is that using visuals with students can create a richer learning enviornment, an environment that creates critical thinkers and develops "stickiness"
*Ok, maybe this post was only inspired by a conversation that actually happened. Mr. Kelly actually used a bunch of words I didn't understand and therefore could not accurately script out. But I would like to thank Mr. Kelly for sharing this with me! Posted in Math and tagged with geography, social studies, visual, visualization. October 15, 2010 by Brett Sparrgrove.